Security guards/gaming surveillance officers: Every hotel, casino, and nightclub in Las Vegas has security staff who face real dangers when something goes awry at the venue. Whether it is violence or unsafe surroundings, these workers are at risk of injury or death. Suffering a personal injury can be devastating and life-changing. Lost wages, piling medical bills, and an uncertain future can all take a physical and mental toll on an injured victim. Dealing with all of this can be even more frustrating when the injury was due to the negligence or recklessness of another. Thankfully, Nevada law allows for personal injury victims to seek monetary damages for harm suffered. There are two basic types of damages in a personal injury case — economic and non-economic. Economic damages refer to monetary compensation that can be objectively verified in terms of monetary losses. Examples of economic damages include past and future medical expenses, past and future lost wages, loss of use of property, cost of repair or replacement of damaged property, among others. Non-economic damages, on the other hand, refer to monetary compensation for subjective harm that can not be verified in terms of financial loss. Examples of non-economic damages include pain and suffering, emotional distress, inconvenience, loss of consortium, loss of enjoyment of life, and loss of companionship, among others. Las Vegas workers have rights, particularly when it comes to workplace injuries or death. 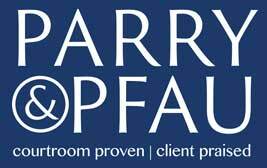 The experienced personal injury attorneys at Parry & Pfau can help you or someone you know get monetary compensation after suffering an injury in Las Vegas or anywhere else in Nevada. Contact us today to schedule your initial case evaluation. Suffering an on-the-job injury can not only cause a significant interruption in daily life, but can result in physical injuries and financial distress. Sometimes you can get injured while on the job. These types of personal injury cases are unique in that they often times include workers' compensation. We'll explain what it is and how it's used in the legal process. Newer PostIs it Legal to Film Police in Nevada?